Named after R.G. Tatlow, Park Commissioner from 1888-1905, Tatlow is a great path to take you from Downtown Vancouver directly through the park and out the other side to its sandy beaches. Loop around the north side of Lost Lagoon and enter on the Tatlow Trail, cutting through the bottom third of the park, and you’ll wind up right at Third Beach. 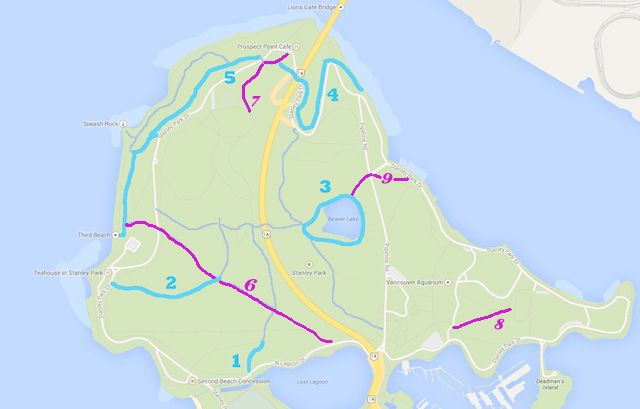 The Prospect Point Trail is the end of the Bridle Path, which starts out near Second Beach and cuts directly up the park, north to south, all the way up to Prospect Point. There is a change in elevation — just think about how close the Sea Wall is to the park at English Bay then about the cliffs at Prospect Point — so be prepared for some steady inclines. Once you’ve connected to Bridle Path, from its start at Second Beach or after turning onto it from Tatlow, head north. I mention the Prospect Point Trail specifically as you might want to veer off Bridle when you get to the baseball diamonds or parking lot, but keep going. You’ll briefly connect with Stanley Park Drive on your left but continue right, past one of my favourite trees that grows at a 90 degree angle (photo below) and you’ll pop out again at the Prospect Point Cafe. This is also part of the bike-friendly trail network. My suggested route for the Brockton Oval Trail is to walk into the park from Downtown Vancouver along the Sea Wall and when you get to Avison Way, the road that will take you to the Vancouver Aquarium, cross over to the path (the one for oval and not point). This is a very quick trail, with a small hill, but it’s a nice walk with wild berries, big trees, and the historic Brockton Oval at the end. There you’ll find a track, fitnees circuit, pavilion, and plaques/markers telling of over 100 years of cricket and rugby matches. Another path that will bring you into the forest from the Sea Wall is the Ravine Trail, from the north east side of the Sea Wall, where Beaver Lake’s waterway connects with Burrard Inlet. You’ll turn off the Sea Wall and cross Stanley Park Drive before it intersects with Pipeline Road. There is a crosswalk that will connect you to Tunnel Trail, head south west and you’ll cross Pipeline Road at another crosswalk to connect to the Ravine Trail that dips down below the bridge into an environmentally sensitive area. This area of the park has unique vegetation, trees, and will connect you with the Beaver Lake Interpretive Trail. For readers interested in the history of the original families that settled on the lands now know as Stanley Park, please look at your library for “Stanley Park’s Secret”, subtitled “The Forgotten Families of Whoi Whoi, Kanaka Ranch and Brockton Point” by Jean Barman. The only trace remaining of their long-time presence is a single lilac tree near Brockton Point and overlooking the City planted by a young woman (Martha Smith) on the occasion of her marriage 125 years ago.